When it’s hot and humid, you reach for a shirt that’s light and wicks away moisture—why wouldn’t you do the same for your feet? Head to Mr. Sid this summer and invest in a pair or two of unlined shoes; they’ll keep your tootsies cool and give them the break they need and deserve. Because unlined shoes don’t have an additional interior leather lining, they’re softer, lighter and more pliable—they’ll stretch and form to your feet faster than lined ones. The unlined leather also wicks away moisture, making these shoes ideal for fashion-conscious folk who go sockless. 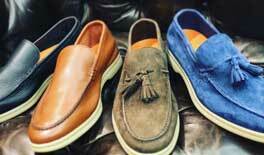 Boat shoes are among the most common unlined footwear, but Mr. Sid offers a large collection of dress and casual unlined shoes for spring and summer. Come on in and try a pair on for size!